This Christmas, are you looking for a small token to hand out to friends? Gifts for your children's teachers? Or one of those all important reserve gifts, for when someone unexpectedly brings you a present and you need to reciprocate pronto? What you need is Homemade Hot Chocolate Stirring Sticks. I first made these when I needed thoughtful but simple gifts for teachers. Most teachers I know have about 73 mugs which declare them to be the "World's Best Teacher." Much as they might love to receive such heartfelt sentiments, it might be nice for them to receive a gift that doesn't clutter up their homes until retirement. How about something tasty to put inside those much-loved mugs? Easy, inexpensive, and fun to make, these are also great if you've got kids who want to get involved. For one thing, no expertise is needed to make these treats, and there's plenty of spoon-licking to be done at the end for those with enough patience! The quantities here are a suggestion only, so enjoy getting creative and making variations. Edible decorations of your choice—gold, silver, and sparkles will all help to create a festive Christmas look. Place your silicone ice cube mould on a baking tray to keep it rigid whilst you work. Using a bain marie (a bowl resting over, but not touching, a pan of just-simmering water) or a microwave, gently melt the milk chocolate, stirring until it is smooth. Pour the chocolate into the silicone moulds until each is around half full. 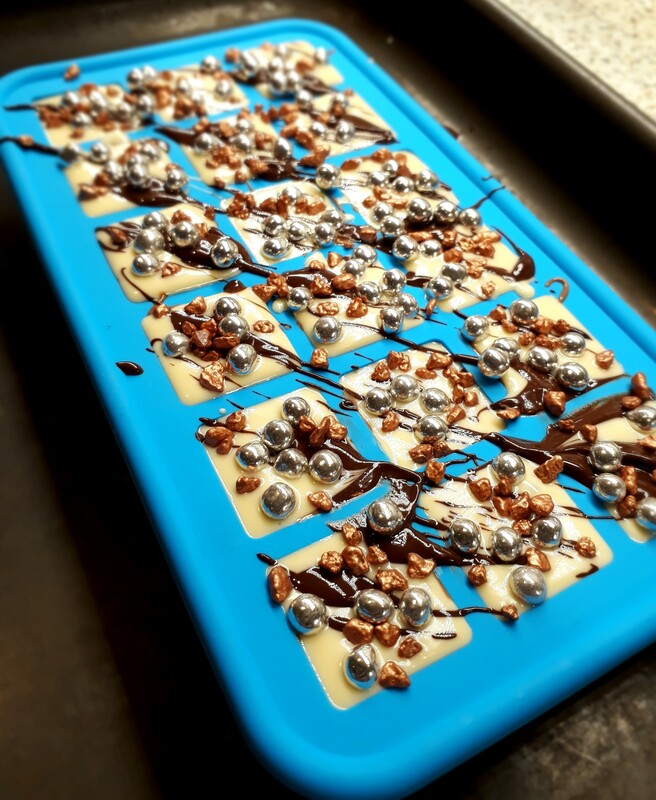 Give the tray a gentle shimmy to level the chocolate out, if necessary, then leave at room temperature whilst you continue with the next stage. Melt the dark chocolate and pour into the moulds until each is almost three-quarters full. The milk chocolate will have begun to cool, but will not yet have set, so another gentle shake will smooth the tops without spoiling the layered look that will be revealed when the Hot Chocolate Stirring Sticks are finished. Reserve a little of the dark chocolate for creating a drizzle design later. Melt the white chocolate. Pour into the moulds until each is almost full, and give a gentle shimmy as before to smooth the tops. Use the remaining dark chocolate to create a drizzled design on top. Decorate to your liking with edible decorations. Shiny and sparkly is a great look for Christmas gifting. Whilst the chocolate is still warm and liquid, gently poke in the lolly sticks or skewers. Depending on the length, these may need to be supported whilst they cool. You can use the lid of a large tub to rest them against in the fridge, see picture below. Longer sticks may need to be supported whilst the chocolate sets. 9. Place the baking tray in the fridge for two to four hours, or overnight if you have the time, to allow the chocolate to set firm. 10. Once set, gently remove each Hot Chocolate Stirring Stick from the silicone ice cube mould. 11. Package attractively and label, then distribute smugly to your friends and neighbours, basking in their admiration at your culinary talents. It only takes a few simple steps to create something beautiful and delicious to give to a friend or relative this Christmas. What's more, Hot Chocolate Stirring Sticks are inexpensive too, but they still look really special. We're all trying to do our bit for the environment nowadays. Did you know that you can now buy biodegradable cellophane to wrap your edible gifts, instead of plastic? Of course, the wooden lolly sticks are also biodegradable too, so with these tasty treats you can be environmentally responsible whilst making your gifts look really special. Merry Christmas.